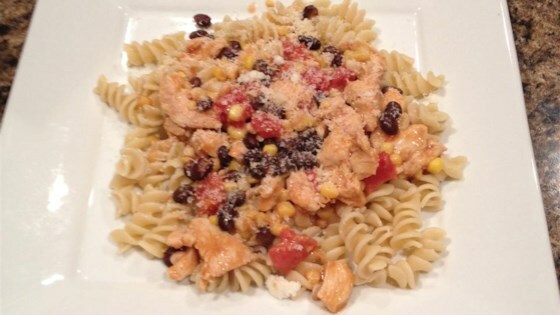 "Great quick dinner, perfect for summer corn leftovers. Two ears of corn yield one cup of kernels. Top with shredded cheese." In a large skillet over low heat, cook corn and black beans, 2 minutes. Stir in the tomatoes, reserving their juice. Season with salt and pepper, and cook 2 minutes more. Pour in enough tomato juice to cover and season with hot pepper sauce and Worcestershire. Increase heat slightly, stir in chicken, and heat through, 3 to 5 minutes. Spoon over cooked pasta. Definitely a little bland-could use some fresh cilantro and green chiles to spice it up. I loved this meal. It was quick and easy and called for basic normally stocked ingredients. It tasted great. and was filling too.